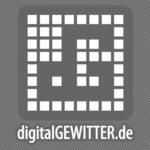 digitalGEWITTER is a netlabel based East Germany. We deliver free digital releases and a monthly podcast. Stylewise it goes through the whole spectrum of electronic music focussing on Drum & Bass and Dubstep.